Tulsidas was a very prominent scholar of ancient India. It is said that Tulsidas was the incarnation of the scholar Valmiki who had penned down Ramayana. Lord Shiva once t old his wife Parvati that Hanumana had given a boon to Valmiki so that he could get the good fortune of praising lord Rama. Valmiki would be born again in the Kaliyug as a renowned saint. Many say that Tulsidas was the incarnation of Valmiki and he had taught many good things through his versus and poems. It is said that Tulsidas was very different from the other kids. He stayed in the womb for 12 months before he was born. He had all the thirty two teeth at the time of birth. At the time of birth instead of crying he called out Rama. That’s why he was named Rambola. At the time of birth he looked like a five year old boy and some astrologers predicted that his staying in the house could be a danger to his parents. So his parents abandoned him and sent him with the maid. The maid took Tulsidas to her village and he stayed with her for five years. After that she died and Tulsidas was an orphan. He would go begging from one house to the other. Some say that goddess Parvati used to take the form of a common woman and she would come to feed Tulsidas every day. Tulsidas did find a guru for himself and spend most of his years as a student in Ayodhya. Some say that Tulsidas did get married and others claim that he was a sadhu all his life. It is said that he once went to the Hanuman temple and his wife went to her father’s house. When Tulsidas got back from the temple and came to know that his wife had left for her father’s house he swam across the river Yamuna just to meet his wife. His wife was very angry to see him and said that he just wanted to have her body so he could not even stay away from her for a few hours. Tulsidas got very angry at this and left his wife. He went to Prayag and spent the rest of his life there. 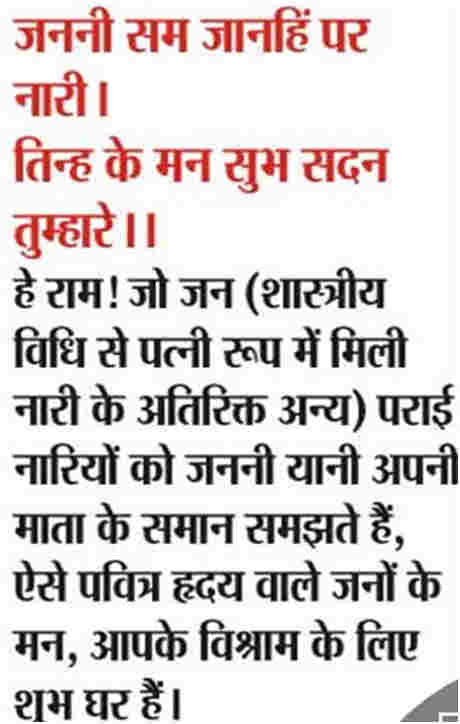 Tulsidas was a great devotee. It is said that he had the privilege of getting the darshan of Lord Hanuman as well as Lord Rama. He was a great poet saint and had a huge number of followers. Tulsidas is said to have performed many miracles too. He could bring back the dead to life. Another interesting story about Tulsidas is that Akbar once heard about Tulsidas and he summoned him. 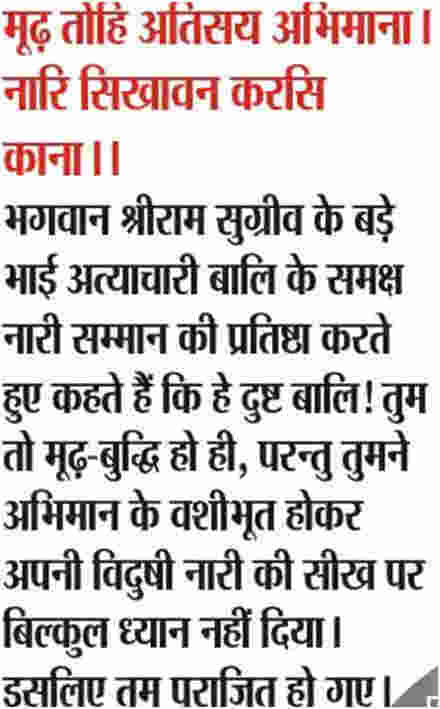 Tulsidas refused to go meet Akbar. However, he was forcibly taken to Fatehpur Sikri. Akbar told Tulsidas to perform a miracle. 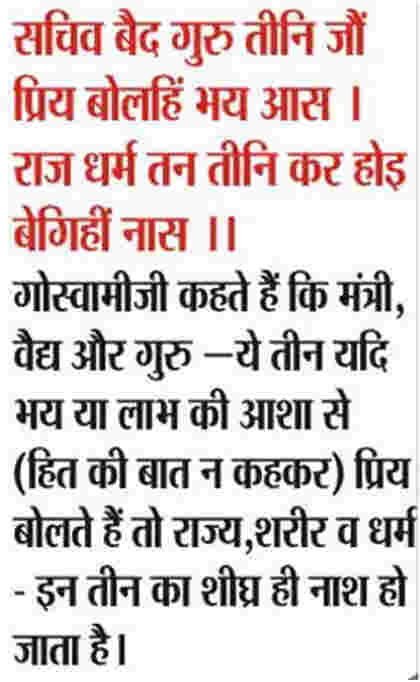 Tulsidas refused saying that he only knew Rama and he could not perform any miracle. Akbar got very angry because Tulsidas refused to even bow down to Akbar as a sign of respect. Tulsidas was imprisoned and he stayed in the jail for forty days. During his stay in the jail he would continuously chant Hanuman Chalisa. After this one day a huge number of monkeys entered Fatehpur Sikri and started to destroy everything. The close advisors of Akbar told him that it was the miracle of the imprisoned Hindu saint named Tulsidas. Akbar immediately released Tulsidas and also apologised to him. After that Akbar became a good friend of Tulsidas and he started to respect other religious beliefs. There are many works of Tulsidas we cannot discuss all in one go. This is why we have decided to pick up some of the popular dohas of Tulsidas. These dohas were very popular and they still hold well, because they are like universal truths that will never change with time. Some of these may seem a little controversial too. In this doha he is discussing about women. He says that when we are in trouble we can test out patience, our morality and the woman in our life. When you are in trouble you must be patient and try to find a solution. The person who has a better level of patience will be able to deal with a crisis much better. Similarly we all have a sense of morality what is moral for me might not be for the other person. At the times of trouble you can realise how low you can get on your morality level. What he says about wife in this doha is that a good wife is one who can stand beside her husband at the time of trouble. If you want to test how much your wife actually loves you and care for you then you can do that when you are in a crisis situation. Some wives may leave their husbands when they need them the most. A wife who is with you at good times is not that important what matters more is that can she support you at the time of trouble. Some may feel that it is trying to put women down by saying that they are actually looking for a comfortable life. On the other hand you can also take it as praise for women who decide to stick to their husbands even in the times of trouble. When Tulsidas wrote this doha women were not working and financially independent as they are today. In today’s word this doha might not be very effective because women are working today and in the time of crisis they can also support the family financially. However, even today many women might prefer to leave their husbands who are not doing well economically can look for a partner who can give them a feeling of financial security. You ill often hear that a man and a woman fell in love in college years and got married only to realise later that the woman had a better potential to earn and be successful as a result the marriage breaks. Let’s now move to the next doha of Tulsidas. This goes as follows. In this doha Tulsidas tells about the kind of followers Lord Rama likes to have. Tulsidas says that a person who respects women is the followers Lord Rama wants. If you are a true follower of Rama then you must consider all women apart from your wife like your mother and only then Lord Rama will stay in your heart. In this doha Tulsidas is telling that a morality of a person is very essential. Lord Rama was maryadapurushottam meaning a person who had all the good qualities and thus he always respected women and never had any desire for a woman other than his wife Sita. In today’s world where there is so much of violence against women of all ages this doha is really something that must be followed. A society where women are oppressed and not respected cannot flourish and that holds true even today. For example countries like Afghanistan where women are not treated well and do not have any say in any matter is dealing with so many economic and social issues. It is said that if you have a son you must teach him how to respect women only then he will be able to do well in life. In this doha Tulsidas says that an intelligent man will always listen to what his wife has to say. It is a common tendency of men not to listen to what the wife is saying. When Rama defeated Bali in the fight he told him that Bali you are very strong and powerful but you could not defeat me simply because you did not listen to what your wife had to say, if you had taken her suggestion maybe the results of this fight would have been different. Tulsidas thus says clearly that women must be respected and their opinion must be counted. If a man always takes the suggestion of his wife he is considered to be a jorukagulam in our society. What Tulsidas is trying to say is that men should let go of their ego and instead of considering women as inferior they must give women an equal chance in everything. A wife is a well-wisher and she must be respected. If Bali had taken the suggestion of his wife he would have done better. Women must be educated and they must be treated equal to men. The countries where women have an equal say in all the matters are doing so well in all the fields. 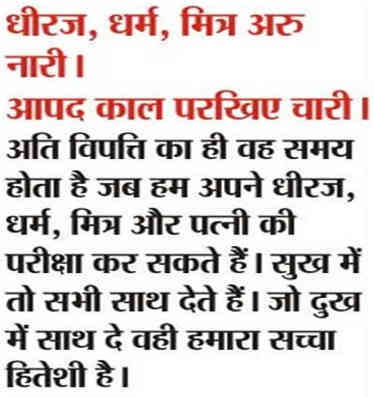 This is another very interesting doha of Tulsidas. In this Tulsidas says that a minister, a doctor and a teacher must always tell the truth. If these three are scared of the king, the patient and the student and as a result they tell only the good things to keep the other party happy then very soon the kingdom, the health and the morality of the society will be in trouble. The education system must be free from all political clutches so that it can impart the best education to the students of the nation. The doctors must not give wrong advice to the patients in order to make more money. For example in today’s world doctors are running behind money and that is very bad for the overall health of the nation. A minister must be honest and do his duties faithfully only then a nation will develop and become prosperous. In today’s world politics has become so corrupted that honest people do not even want to get into politics. This must change and politics must be taken up by more and more honest people for the benefit of the country. We will now move on to the next doha of Tulsidas. This doha is as follows. In this doha Tulsidas says that it is human nature to get impressed by the dress and the beauty of the other person sometimes even the cleverest people can be deceived by the beauty and the looks of others. For example a peacock is so beautiful but have you even seen the way a peacock attacks and that can be very fatal. So what Tulsidas is saying that we should not judge a book by the cover? We must go deep into the heart of the person and then decide if we want to be associated with this person. If we get impressed by the external looks then there is a possibility that we will be deceived and we may have to pay a high price for it. For example the glitter of the glamour world can be very attractive but when you get into it only then you can realise the price that you may have to pay to become a part of this glamour world. Instead of looking only at those who have become successful in this field you should also look at the ones who have failed. Anything that looks very gorgeous can also be very fatal. These are just few of the many dohas that were penned down by Tulsidas. We will try to discuss more about Tulsidas and his works in our forthcoming articles. Tulsidas was a great devotee of Lord Rama that is why most of his dohas have a direct or indirect reference to the lord. He was a poet saint and he wanted that his works should make people more moral and religious. These dohas are indeed very well thought and written as a result they can still be referred to although they were written many years back. We hope that you found this article interesting and informative.